National Bring Your Dog To Work Day is taking place on Friday, June 22! This annual event is held to raise money and awareness for canine rescue and helps provide resources for the rehabilitation of abandoned dogs. “This is a day to celebrate dogs and show the stress-reducing benefits they can bring to all employees in the workplace. It is also an opportunity to raise awareness and funds for canine charities. Good socialisation should start early in your dog’s life so it can cope and enjoy new situations. My style of training is very dog focused and based on trust building with positive, reward-based interactions. So, I believe you must consider taking your pet to work first and foremost from your dog’s perspective. While your workplace is very familiar to you, it will be a strange and new environment for your dog. You should assess if your working environment safe and secure, that all hazardous materials or equipment stored is a dog-proof way, management and all other staff approve and agree with your bringing your dog to work and check there is a safe area where the dog can be exercised. Also, consider how you will safely commute to and from work with your pet and have a back-up plan in case you need to leave early if your dog is distressed. “When you have your dog in the workplace, it should be kept on the lead and accompanied and monitored at all times,” Robin says. 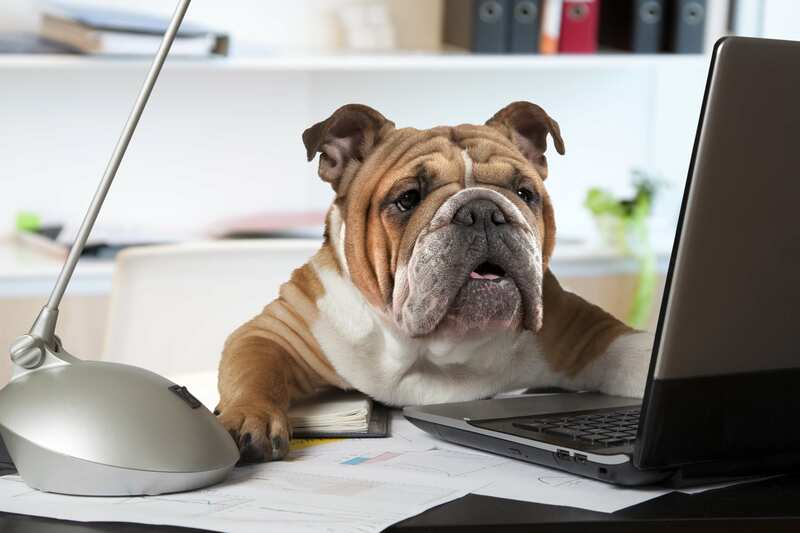 “Dog-proof your workstation before you bring your dog in and read your dog’s body language for any signs of distress or discomfort. Bring in a dog bed, blanket or toy from home for the comfort of familiar smells and ensure there is a quiet place for your dog to rest. It’s also probably a good idea to pack disinfectant spray and a cloth – just in case of accidents." “Be prepared and make sure you bring adequate food, water, dishes and snacks to keep your pet happy and sustained for the whole day.